In the 8 years since Alexander Payne's Sideways came out of nowhere and gave us a thoughtful consideration of human beings, not a single cell of this talented director has atrophied. The plot of The Descendents is one that can easily be made into a maudlin and sappy film, one that tugs at our easily tugged strings and manipulates emotion. Payne however shows remarkable restraint and the gentle, light touch of a master director in making a film that emotionally connects but never telegraphs the emotions it wants us to feel. It's a tall order, but with the help of a talented cast (George Clooney gives his career best performance, and Shailene Woodley is absolutely wonderful) and a deft touch that sets the tone of the film, which is at times light-hearted and at times heart-breaking but most of all human, Payne delivers a film that asks some very important questions about the nature of forgiveness, family, and legacies. As we begin in Hawaii, the romanticism of the island is quickly denounced with the easy-going nature of the setting jostling with the urbanity of the place. Matt King (Clooney), a disaffected father (or, as he puts it, a "back-up parent") of two, finds himself facing a life where his wife is in a never-ending coma, and he has to connect with and understand better, his daughters. When he finds out that his wife may have to be pulled off life support as it is in her will, and that she was having an affair before she met with the accident, at the same time, Matt must face the reality of the family estate he is the trustee of, the affair he knew nothing of, and the children who are growing into different people. 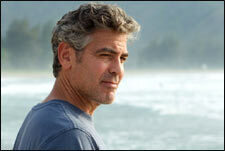 Payne and Clooney together chart the choppy waters of the nature of forgiveness - Matt has been a neglectful parent, and his absence from their lives needs forgiveness from the soon-to-be-dead wife, while he has to learn to forgive her for her transgressions before the plug is finally pulled. There is a vast array of confused emotions he feels, and Clooney brings them to life magnificently as he travels across the island meeting his relatives to talk about the tragedy and the estate. Another recurring theme, and endlessly fascinating to me, is the nature of legacies. The real estate in question that needs to be taken care of is treated as a metaphor for what Matt thinks he needs to leave behind for his daughters - his values, his nature and what he wants them to be. It is beautifully handled in his interactions with both of them. The younger, more precocious one has a smaller arc as she comes to terms with the tragedy, but Shailene Woodley delivers a beautiful performance as a young woman who has to forgive her parents and learn to grow into a bigger, more important role in the family. The film has a lot of things to say about the nature of family - with Matt confronting a family man who had the affair with his wife, meeting his extended family to deliver the news, and learning to be accepting of new members - but none so important as when it focuses on Matt and his daughters learning to be a family, and what it means to them, and how their definition shapes them as people. This is an incredibly fascinating rumination, and Payne takes all these big themes and delivers them gently, with a dash of humour, creating a film that is more interested in having a conversation about these topics with us rather that telling us what to feel. It is a far less taxing and a far more rewarding experience than any film which treads similar ground. If not just for that, watch it for George Clooney giving the best performance of his career so far, but watch it. Be the first to comment on The Descendants! Just use the simple form below. fullhyd.com has 700,000+ monthly visits. Tell Hyderabad what you feel about The Descendants!